Chin augmentation can dramatically improve the appearance of your entire face by correcting a receding chin or a chin that sags from the jawline (chin ptosis). At Cascade Facial Surgery, Dr. Jonathan Grant treats every patient as a unique individual. Your surgical plan is designed specifically to provide you with the result you want within the parameters of sound and safe medical practices. Dr. Grant’s training and experience as a reconstructive facial surgeon allows him to evaluate your chin and determine the best way to restore facial symmetry. This surgery usually involves the insertion of a chin implant. Some patients have rhinoplasty (cosmetic nose surgery) along with chin augmentation to create greater facial harmony between the nose and chin. Dr. Grant will examine you during your consultation and discuss what you dislike about your chin. Then, he can devise a surgical plan for you. During the consultation, we use the Canfield Mirror imaging software to help you see different looks on your face as an approximation of how you would like your chin to look. The surgery is an outpatient procedure that can sometimes be performed using IV anesthetic and sedation, while some patients may require general anesthesia. You will be able to go home on the same day as your surgery. 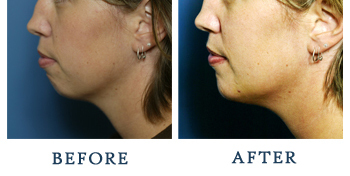 Incisions for chin augmentations are usually made under the chin in a preexisting skin fold. The implant is then inserted in the proper place, and the incisions are sutured. You can expect to need a week to two weeks off from work after chin augmentation surgery. You will have no diet restrictions, but please avoid sports and exercise for two to three weeks. After all surgeries, there is some pain and swelling. Some patients also experience some mild bruising. There may also be some numbness in the incision areas and possible (rare) on the lip, which typically resolves within days to a few weeks. You can take pain medication, and we will give you instructions how to take care of your chin during this time. Sleeping upright or with your head elevated for the first two weeks will help to keep swelling to a minimum. Note that swelling is the last symptom to resolve. While your chin will look better immediately due to the implant, it will take some time for the last bit of swelling to go down. Dr. Grant will check you intermittently throughout the first year following your surgery. Most of our patients remark that the recovery period is quite easy and well worth the results. If you are interested in chin augmentation in the Western Washington area, contact us to find out if you’re a good candidate for the procedure.